Today, many consumers are looking to shop small, eat slow food and fundraise for people in their own neighborhood. And this focus on local also applies to where consumers think companies should address important issues, as 43 percent of Americans say they want companies to prioritize quality of life in their local communities (vs. 38% nationally or 20% globally). Now, one business is partnering with a nonprofit to bring a hyper-local label to a community, tackling a unique issue while empowering consumers to make educated purchasing decisions. If you head to Ace Hardware stores in Washington's San Juan Island area, you may notice a unique label on products in the stores – one that was created specifically to address an issue of that area. 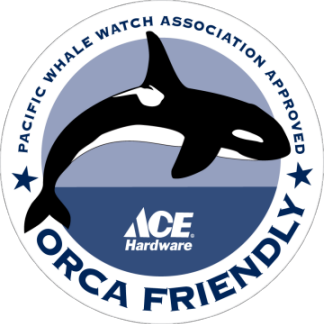 The stores' manager, Randy Burgess, partnered with the Pacific Whale Watch Association (PWWA) to launch an "orca-friendly" label. What's the connection between hardware and orcas? When individuals use harmful products on their homes or lawns, those chemicals can end up in watersheds. "It just so happens that our watershed here in the Pacific Northwest has endangered orcas in it," said Michael Harris, executive director of the PWWA to Fast Co.Exist. The label helps consumers make educated decisions that directly impact their local area. The idea was initially suggested by Captain Hobbes Buchanan, owner of San Juan Island Whale & Wildlife Tours and Black Fish Tours of Friday Harbor. He said, "We know there's a big constituency of consumers especially here in the Pacific Northwest who want more information to inform their buying behavior, to make sure what they're putting on their lawn or using to clean up around their house isn't harming our endangered Southern Resident orcas – or any creature out there." The label can now be found on more than 100 cleaning and garden products in the Ace Hardware stores. Although the "orca-friendly" label is at a grassroots stage (currently based on Burgess' knowledge of the products he carries, not scientific evidence), it shines a light on how companies can use labels to engage and activate consumers at a community level. Nearly nine-in-10 (86%) Americans say they think companies need to do a better job showing how social or environmental efforts are personally relevant – and hyper-local labels and communications can help show consumers how issues can have an impact, oftentimes right in their own backyard. Amr Arafa is trying to create a home away from home for some of those who need it most. A new app allows tourists in Southeast Asia to help track and capture one of the region’s most notorious predators: animal poachers. NIKE, Inc. has announced a new strategic partnership with private equity firm Apollo Global Management, LLC, aimed at building a transparent and ethical apparel supply chain in the Americas. Inside an Ace Hardware store on the edge of Washington's San Juan Islands, some products have a new label that reads "orca-friendly," with a logo showing one of the whales that lives in the water nearby. CDP’s supply chain program will soon begin rating companies on how well they manage carbon and climate change in the supply chain. The number of standards for green products has grown in recent years due to increasing market demand for environmentally-preferable products, resulting in concerns over greenwashing and a need for an international standard. Imagine grabbing a tube of paint, dipping your brush in the black goop and gliding the brush across a canvas. Pretty normal, right? Now image that black goop is made entirely of air pollution emitted from vehicles across Asia, and you can actually use that polluted air to create a masterpiece. Edible food packaging made of milk proteins can reduce waste and prevent food spoilage, according to US Department of Agriculture researchers who are currently developing this casein-based film. The medals in the 2020 Tokyo Olympics will be maybe just a little more hard-earned than usual: The Japanese organizers are hoping to source the medals from e-waste, stripping gold, silver, and bronze from old gadgets and cellphones. Turning your donors into fundraisers can be seamless with the encouragement, motivation, and technology. About one in three affluent donors said they could have given more but didn’t, in part because they wanted more information on what their gifts would achieve, according to a new survey of American donors who give $10,000 a year on average. When I was a kid, I would start writing my Christmas list in August. I wanted plenty of time to edit and revise the draft until I was sure that Santa would understand exactly what I wanted (and which items took priority). It's a given that nonprofit and for-profit boards have different motivations for doing what they do for their organizations. Increasing sales of fruits and vegetables is as simple as increasing interesting and innovative marketing. It’s that easy. Unsubscribe laustin@conecomm.com from this list.